School Holidays and Vanilla Eclairs! It’s school holidays in Australia! Yay! I missed the last two challenges of French Fridays with Dorie. The first week I was sick with the flu and the next we were in Melbourne. I was determined I was not going to miss another week! So I decided, despite having 6 of my 10-year-old son’s friends over for the day, I would make this week’s recipe! The Vanilla Pastry Cream came together perfectly over arguments discussions about why they can’t watch Sucker Punch or Red Riding Hood at the cinemas. It chilled in the fridge as I stood out in the middle of the street directing traffic so the boys could scooter and skateboard out of our steep driveway at full speed. It was all good! I was in control and feeling pretty chilled! Next, the Cream Puff Dough! I went through a phase some years back when I made profiteroles on a regular basis so I was feeling pretty confident. 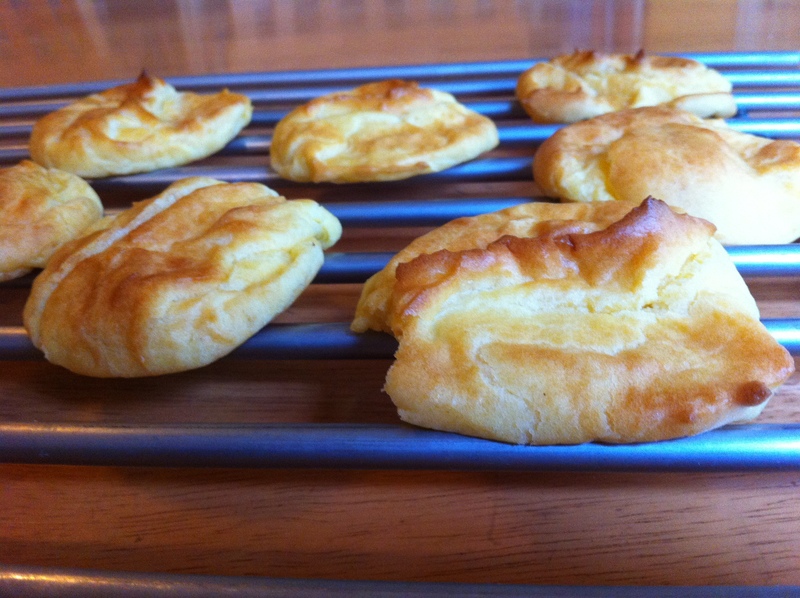 my Cream Puff Dough didn’t… puff! Hard as I tried, there was no way these babies were going to be filled. They tasted pretty good, but were flat as pancakes! I learnt something from my house full of tenacious and relentless boys, don’t give up, cos you’ll eventually get what you want if you keep pestering trying! The second time around I cut a hole at the end of a sandwich bag, filled it with the dough and squeezed out the eclairs! Yes! This time it worked! I was pumped! I managed to complete the recipe! I piled the boys in the car and met a friend who had the rest of their friends waiting for us at the cinemas. We settled on ‘Diary of a Wimpy Kid 2’. We sat them all into their seats and just as we started to think okay! They are in a contained space and we can relax for the next 90 minutes or so, we realised we had taken boys, that already had the resources and stealth of seasoned ninjas, to watch a movie that turned out to be an instruction manual on how to get away with absolutely anything! We sat and watched in helpless terror! To see more versions of this week’s recipe and read more stories visit French Fridays with Dorie! Tags: baking, cakes, cooking, family, food, french food, french fridays with dorie, life, motherhood, my life, raising kids, recipes | Permalink. Six boys! Wow, you are a brave soul! 🙂 I would have been totally worn out and not had the energy to make eclairs! Your second batch puffed up beautifully. Well done! So glad you are feeling better, enjoying spring break, and back cooking and baking with us! It feels so good to be back on track! Thank You! How funny! Yeah, the previews for that movie are pretty entertaining, especially since I used some of those reasons and tricks to get out of trouble! Your puffs look great. I too had some issues when them not rising. I’m probably going to use the allrecipes version next time. Great post! It was a pretty funny movie, I enjoyed it more than the first one. I felt I wanted to cry when I saw how flat they turned out! I’m glad it wasn’t just me who had that problem! and entertain 6 ten year olds at the same time deserves a lot of credit. Tricia and I, plus grandson and grandpa had no trouble eating them. With vanilla cream filling, what’s not to like. Thank You! I have to warn you though, the bag was pretty messy! And they did taste amazing! 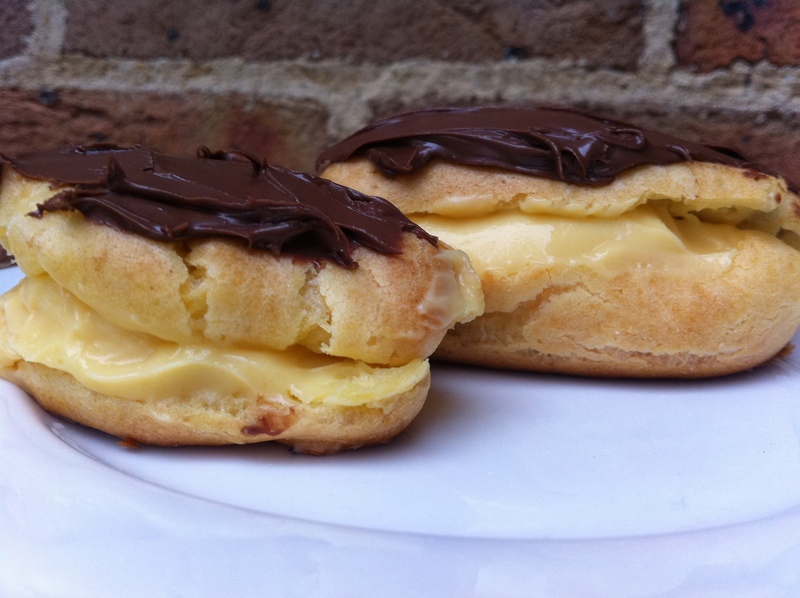 Vanilla eclairs, yum. Its been a while since I’ve had a profiterole and their appearance here are making me drool. It’s been ages for me too! I felt out of my depth but I really wanted to give it a shot and I’m glad I did. I get off on that sense of achievement after each week’s recipe! Favourite blog phrase of the week: Chasing after angels. What a crazy day! So glad it worked out in the end. Love your storytelling! Thanks! What a crazy day indeed! I’m impressed that you attempted making these at all, considering the busy day you were having. They look beautiful – especially the ganache! They tasted amazing and I am so glad I persevered! I’m also glad I wrote about it so I won’t forget the crazy stuff I got up to! It was a delight! The memory is so much better in hindsight! I’m not much of a drinker, but I’m starting to see the merits in it! Wow…maybe I’m just getting OLD but I can’t imagine having a house full of running boys and starting a project like eclairs!! Kudos to you! I am stressing out because I will be watching my three grandkids next week for the three days before Easter. I am having 13 people for Easter dinner! Your eclairs look amazing!! Sorry about your first batch! Maybe if I gave it more thought I would have been more sensible, but I tend to act and think later! 13 people! I feel exhausted just thinking about it! Have a great day! I’m impressed that you made two batches of these while running after all those boys. I hope the movie didn’t teach them too many new tricks. My eclairs were on the flat side, though I could slice them, and they did taste good. Great post this week! I missed you guys and the whole process as well. I felt great being part of it all again! I think the movie just enforced what they already knew! 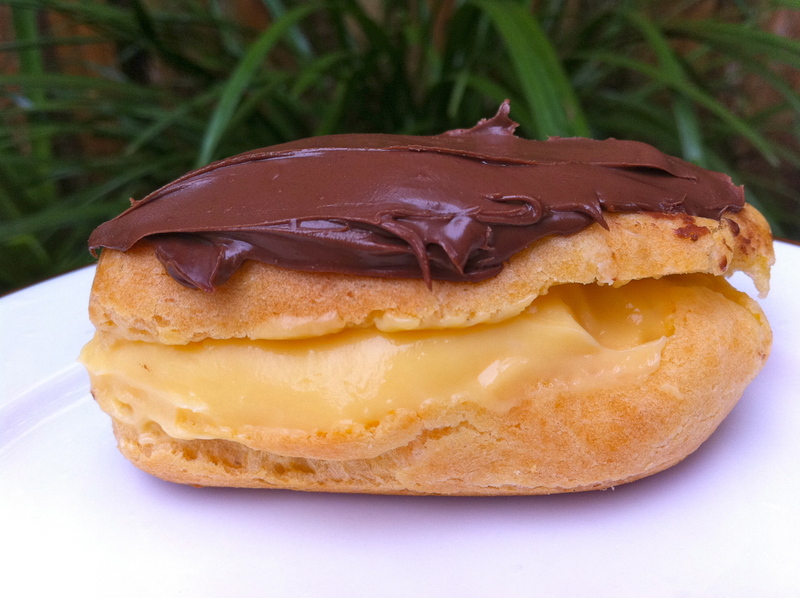 I love eclairs and make them all the time! I’ve never tried custard cream, usually just fill them with whipped fresh cream. Might need to try custard one day! I recommend it, they really did taste great! You are a brave soul! Six boys! Next time there’s issues over a movie, there’s always the bowling alley. I also had to make a second batch of eclairs, but saved my undercooked ones in the freezer to play with later. I tried suggesting bowling but they weren’t interested! Our bowling alleys are dark, loud and have a nightclub feel. I don’t know if I would have coped! I’m so glad you persevered…your second batch is picture perfect!!!! I see your multitasking paid off at the end, your eclairs look wonderful! I could never have done mine if my kids weren’t at school at the time and I could fully focus on these…the kids and eclairs would just drive me up the wall, debates, deflates and all!